While founder, and its somewhat less disastrous variant, laminitis, are more common in equines than bovines, they do occur in cattle. The Merck Veterinary Manual notes that it's most often seen in young beef bulls and feeder calves consuming carbohydrate-rich rations. Founder and laminitis refer to inflammation of the hoof's internal connective tissue. When an animal founders, the hoof becomes deformed, causing abnormal shaping and growth, including hoof wall concavity and ridge formation. Abscesses develop, and the sole might ulcerate. Immediate treatment is crucial to save the animal. Your vet might prescribe anti-inflammatory medications. It's important to keep an affected animal upright and moving. If the animal recovers, she might suffer from mild foot inflammation and lameness for the rest of her life. 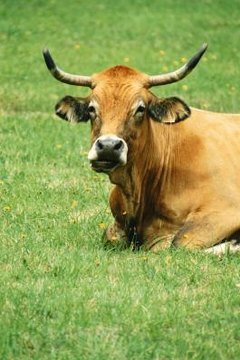 The most obvious sign of a foundering or laminitic bovine is lameness. In acute cases the animal is in such pain that she is unwilling to stand. You might notice a calf crawling on the ground on his knees, or frequently standing up and lying down. Affected cattle might cross their legs to take the weight off a severely painful limb, or stand with their feet underneath their body. They often appear to be in respiratory distress and sweat heavily. Symptoms of moderately affected cattle are more subtle. If a cow or calf seems to walk daintily on soft ground, remove the animal and lead her on a hard surface. Lameness is usually discernible at that point. Founder occurs when poisons form in the animal's rumen, the second part of the four-part stomach. If a cow experiences extensive dietary changes, the rumen can become acidic, killing off beneficial organisms within it. Toxins then head into the animal's bloodstream. Blood vessels in the feet swell up, causing severe pain and damaging hoof tissues. Changes occur in internal organs, including the kidneys. Founder or laminitis usually results within 24 hours of rumen disruption. To prevent founder or laminitis, avoid feeding too much grain to your cattle. Cattle shouldn't be fed grain free-choice, although hay is not a problem. If changing feeds, do so gradually over a week's time, rather than overnight. If you want to significantly increase the amount of daily feed, that should also be done in increments over several days, rather than all at once. According to the Alberta Ministry of Agricultural and Rural Development, "The risk of laminitis increases as the percentage of forage in the ration decreases."